Curious George Goes To Town is large play area at the very back of Woody Woodpecker’s KidZone. 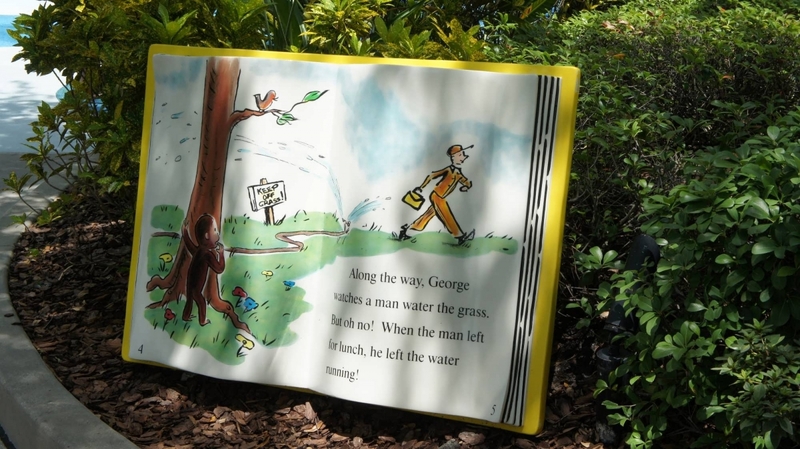 Prepare to have your curiosity matched with gallons of water in this interactive area based on the stories of a beloved monkey named Curious George. 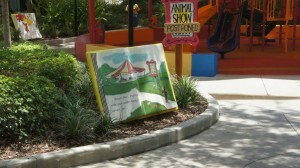 Curious George Goes To Town at Universal Studios Florida. When crowd levels are slow to moderate, the attractions inside Woody Woodpecker’s KidZone, including Curious George Goes To Town, typically do not open until 10:00am. 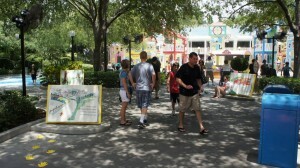 When crowd levels are busy to very busy, the attractions typically open when the park opens at 9:00am. 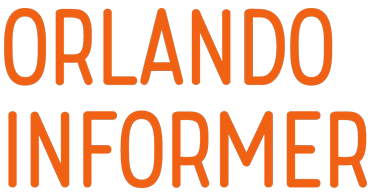 Visit our Universal Orlando crowd calendar (the link will open in a new window) to determine the crowd levels for your travel dates. The opening time for each of the KidZone attractions is listed in Universal Orlando’s in-park map, which you can pick up at the front of the theme parks. Click any image to view it full-screen. 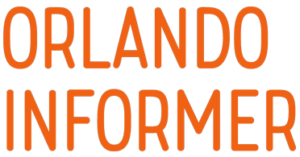 When the full-screen image is open, click to the right to advance through the gallery. 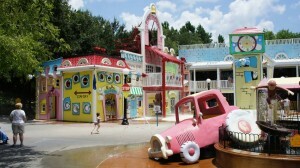 If you need a water ride at the Studios side of Universal, you are WELL taken care of here. You can get soaked, soak others, shoot others with nerf balls, pretend you're a monkey, what more fun could anyone have? 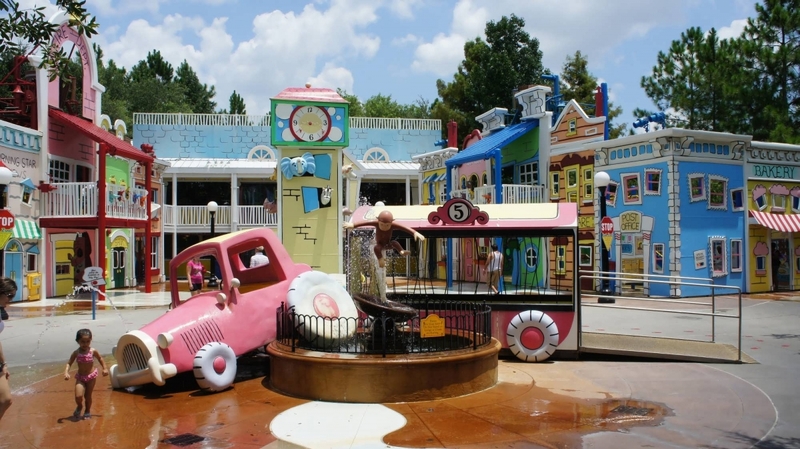 This attraction is the dead end of the kid's section, but well worth the walk to let loose with your children or your group. Just keep those cell phones away from the water! 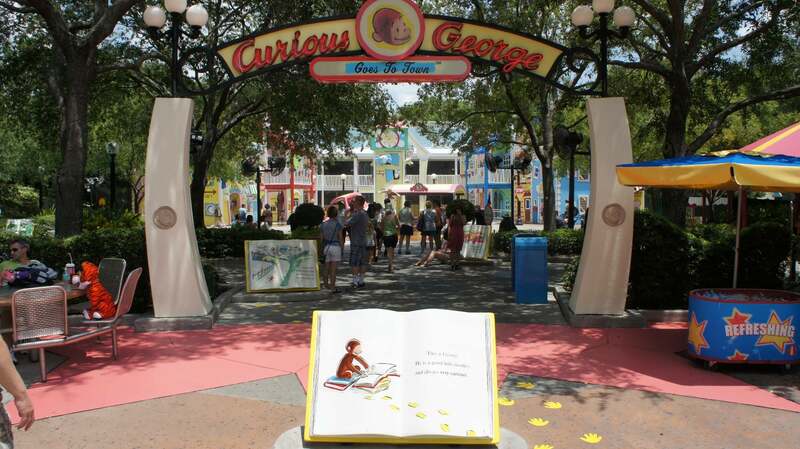 Having visited universal many times, we ALWAYS make a pit stop to Curious George. I love the fact you are in a mini town and can walk up and down the stairs! This is a perfect area for anyone wanting to cool down or just have a break from the lines. One of our best (and funniest) memories of this area is asking our family friend to stand underneath the fire department! (We ensured he had nothing on him which would be ruined.) The children were keeping him busy before he could realise the bells were going and the water was about to fall on him!! Safe to say now he stays well away from the fire department!! You should have seen his face!! 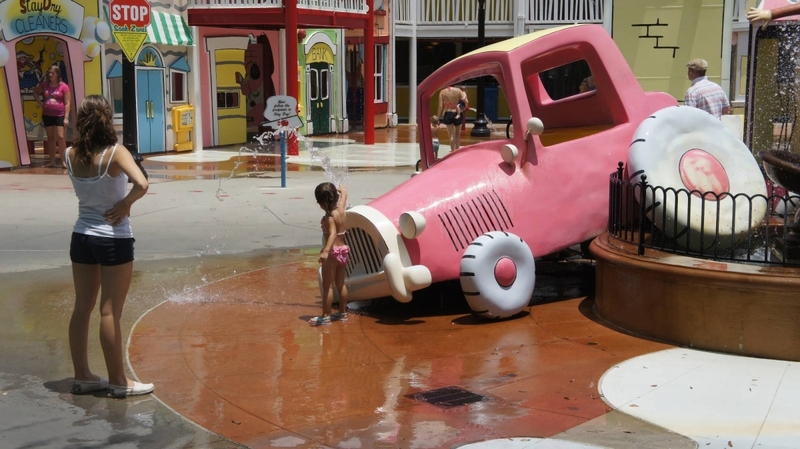 There are many pipes, buttons and spray guns for children to play with to ensure everyone is soaking wet! 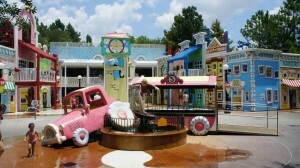 Somewhere for all the family to cool down and to get away from the standing in lines of the park!! Upon approach, this place comparable to a zoo. Forget Curious George, these are real, wild monkeys. And they absolutely 'went to town' on my poor son who received a face full of water and came running over to me immediately. I think this is the place where the lazy parents leave their over-hyped children to run amuck whilst they sit their tired selves down after enduring the Barney show. I don't know about their parenting but my son has some decency. The attraction itself is fun - well laid out, and interesting - but the crowd is not. It's actually anything but. Leave your 'curiosity' be, this place is not worth the struggle. Perhaps not just for the little ones? I see that most other reviews are from parents saying how great it is for their children or grandchildren, but I am here to tell you as someone who is approaching their 20th birthday that it is just as fun now and I have plenty of friends who'd agree! 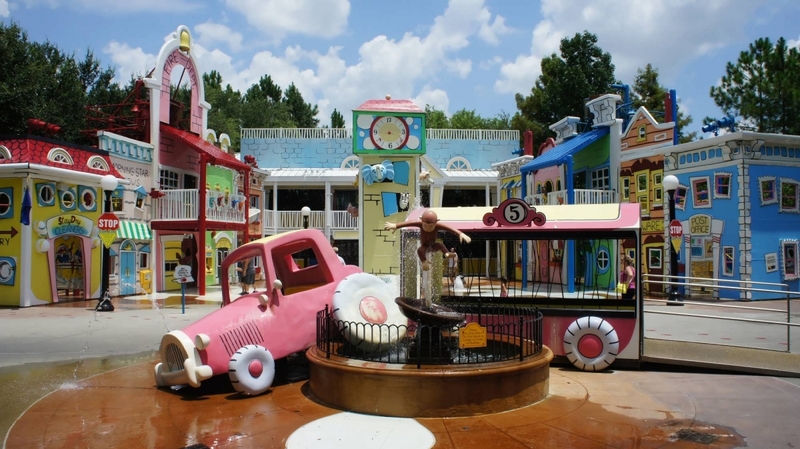 Upon first approach you see brightly coloured streets and "buildings" that provide plenty of places for one to splash around and get wet, as well as soak other people! There's even a giant bucket of water filled with many gallons of water that will dump out on everybody at periodic intervals! If you are invested in staying dry, this area is not the place for you! Never fear though, all you have to do is follow the marked footprints to the back of the area where you will enter into a huge building with two floors of fun! It's filled with foam balls and plenty of things to do with them! You can see them flying through the air after they are shot from cannons, there are air vents to make them float, and if you team up with someone you can even pull them up to the second floor with pulleys! All in all, this is a great area to take a break from the hustle and bustle of the park and partake in some shenanigans for a while! Bring out your inner child! No lines no waiting. Fun pretty much for all ages. All sorts of gadgets for the kids to pull and tug with one purpose in mind "get wet". 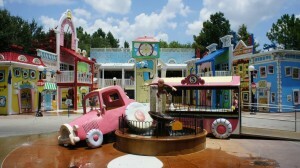 Nicely tucked away in the back is this water playland. Kids could of stayed there for hours. Benches for the parents to sit and watch the kids go nuts with excitement. 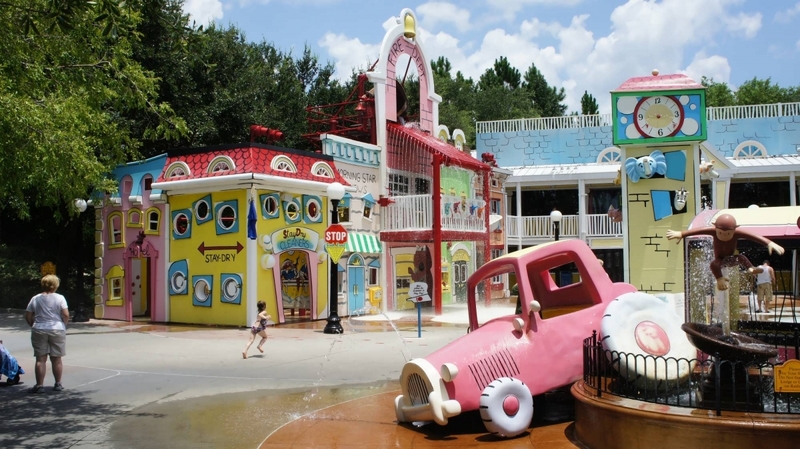 We may just go back and splash around here for the day instead of doing everything else (we have year passes). My only complaint was that there wasn't a locker nearby so I could stash my belongings and join in on the fun.